Based on the 8-bit graphics from Super Mario Bros, you can now join Mario and his friends on their quest in any room of the house! Stickers are removable and reusable – and come so life-like, it’s like watching the game on pause! Protect tables and other surfaces from water rings with the help of these flashy Super Mario coasters! Each coaster is crafted on your choice of either a cork or wood backing, featuring cool pixelated prints of Mario’s items and enemies. Become the most fashionable cook in the Mushroom Kingdom with these trendy Super Mario aprons. 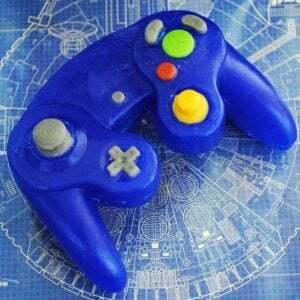 Inspired by some of Nintendo most iconic characters, you can choose between designs of your favorite heroes, villains and princesses! 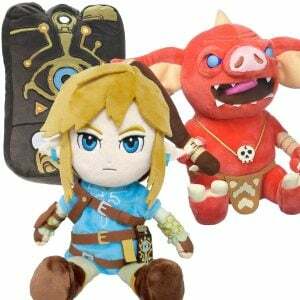 Link, Bokoblins and the Sheikah Slate now come in adorable plush form! Bring one along to all your adventures! They look like they’ve stepped right out of your TV for you to carry on your own journey or as a keepsake for your desk! Level up your geeky jewellery collection with one of these amazing Spiritual Stone rings! 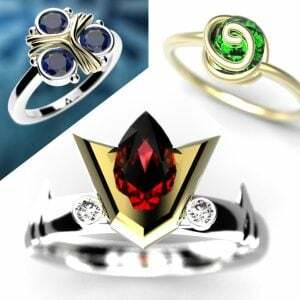 Inspired by the stones from the Ocarina of Time, these gems are made from a professional jeweller and don’t require any boss fights to obtain.